You are here: Home / AidPod / Should AidPods carry advertising? 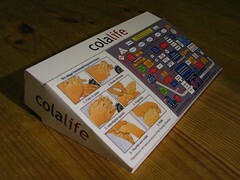 I am a designer and have been following the ColaLife project with great interest. Recently you posted a section on your blog entitled ‘Is wealth creation the new philanthropy?‘. This got me thinking about how the aidpod itself could generate income. You may have considered this approach already but I thought I would suggest these two ideas just in case. Could the AidPod be used as an advertising space? The pod itself acts as space for advertising with adverts printed onto the pod. The money from the advertising goes to the Coca Cola franchisee to pay for each pod’s inclusion. Coca-Cola may feel very reluctant to allow any competition advertising alongside their brand. There is the moral debate of advertising to people in such desperate situations. Then this lead me to wonder . . .
Could the advertising potential of the AidPod be used rather as a place to disseminate useful information? 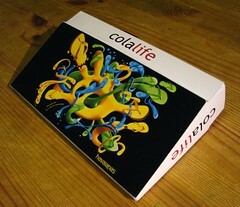 I think ColaLife is a fantastic project and hope to see it go from strength to strength. What do you think? Could AidPods carry advertising? Disseminating useful information seems like a no-brainer. However, as for advertising, it would be important to determine who the target audience would be and how much exposure that group would have to the AidPod. If not much exposure, would advertisers be keen on paying for it? 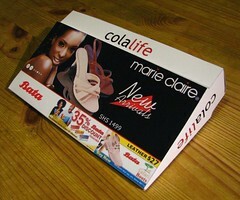 I agree with Clare seeing a problem in AidPods carrying ads and the brand space of Coca Cola. 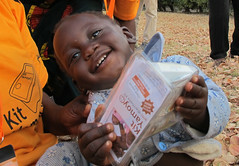 Yet the dissemination of useful information seems like a perfect side use for the Aidpod. Is it possible to have ads on one side and a social message on the other? Also, would the advertiser be eligible for a tax deduction given it’s an aid product? Social advertising and useful information… Absolutely!!! Commercial advertising is tricky; my conscience says no unless it’s for products/services aligned with ColaLife’s values (Durex condoms comes to mind). 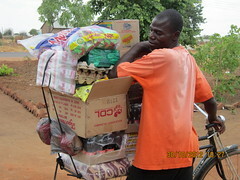 Developping countries need aid and support, they do NOT need to be infected with our affluenza and over-consumerism! Coca-Cola will already be getting terrific advertising for their service of distribution, however they will NOT be keen on other companies piggy-backing their adverts on “their” social initiative. One risks opening’s Pandora’s box as any commercial advert on the AidPod would ieermediately link Coca-Cola with the advertisers’ product and implicitly infer that Coca-Cola supports said product. To expect Coca-Cola to carry the AidPod with commercial advertising might be a step too far for them and I can easily see them pull the plug on all distribution! 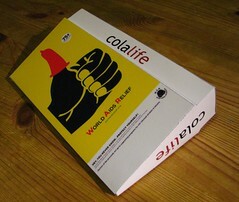 ColaLife needs Coca-Cola’s good graces, especially now; or the AidPod will never materialise…. Who would want to advertise to this audience? Drink distributors (conflict with cola), Cigarette companies (ethical conflict ?) .. If you can reslove the conflicts and still find an advertiser willing to pay then it should be done. No ethical conflict per-se in attracting corporate money to make a good cause work.